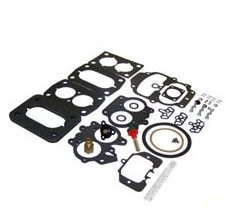 Carburetor Rebuild Kit for 1976-90 Jeep 232 or 258 6 Cyl. Engine with Carter 2 Barrel. This rebuild kit includes all needed gaskets, needles and seats. THIS KIT DOES NOT INCLUDE THE STEPPER MOTOR OR THE VACUUM CYLINDER.